Outline: The story of the woman at the well, in dramatic narrative form. Simple application and invitation. 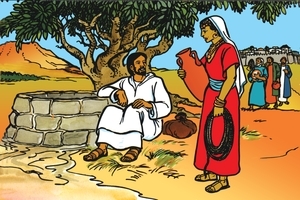 God's Book tells us that one day at noon when the sun was very hot, a woman went to the village well to get water. She saw a man sitting on the side of the well. She did not know that the man was Jesus. And as she put her pot down He said, "Give me a drink." She looked at the man with surprise and answered, "You are not of my tribe. Why do you ask me for a drink? Your people and my people have nothing to do with each other." "If you knew Who I am you would quickly ask me for a drink, said Jesus. "What!" replied the woman. "You have nothing to draw water with and this well is deep. How could you get water?" He answered, "Whoever drinks this water will be thirsty again in a little while, but whoever drinks the water I have to give him shall never again be thirsty." "This is good news,," thought the woman. "It would be wonderful not to have to come out in the blazing sun every day to draw water." "Sir", she said, " Give me this water you speak of so that I will never be thirsty again. I do not like to come so far to draw water." Then Jesus said, "Go and call your husband." "I have no husband," she answered. Jesus said, "You have had five husbands, and the one you have now is not your husband." The woman said to herself, "This is no ordinary man. He knows all my affairs without being told!" Then she answered, "I can see you are a man of God (sent by God). When the Son of God (our Messiah) comes, He will tell us all things, because He knows everything. Our fathers have told us that some day He would come and show us the true way to God." He answered, "I myself am Jesus, that Promised One." Away ran the woman, calling out to the people in the houses she passed: "Come and see a man who knows everything! He is Jesus, the One our fathers said would come! He is the Saviour! (For she believed this One could become her Saviour from her sins.) "Come and see! He's at the well!" The people came out to see what all the stir was about. When they saw Jesus, they begged Him to come to their village and stay with them, so He went and stayed a few days. What was the water Jesus offered the woman? It was not water to drink. It was eternal life and forgiveness of sin. Many asked Him to forgive their sins and give them eternal life. To all who asked for this new life, He gave it to them, and great joy came to that village. Jesus gives forgiveness of sins to all those who believe in Him, and want to leave their sins. He gives them eternal life. Have you received His gift? Jesus is here now, and He will give it to you also, if you ask Him. GRN has recorded a version of this script in 366 languages and dialects. See full list.